To be honest, calling it a second series is something of a misnomer as it bears no real connection to the first one from 2002, aside from being a show about a jury, which is something of a shame as that show remains one of the televisual highlights of my life. It was one of the shows that introduced me to love of my life Helen McCrory and also featured a smoking hot pre-Hollywood Gerard Butler, but also played out as a rather satisfying combination of character study and legal drama. This time round, the case in question was a retrial of a triple murder, but the focus is as much on the lives of the twelve people eventually selected as jurors. I’m not quite sure why Morgan decided to revisit the format, as in the end it was to somewhat lesser effect for me. 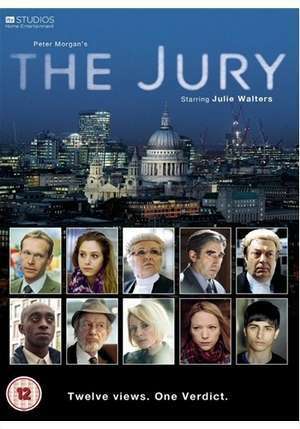 Chief amongst my difficulties was Julie Walter’s performance as the defendant’s lawyer Emma Watts QC which dominated the show. I couldn’t quite put my finger on what it was about her turn that didn’t work but it was something around the forced prickliness of the character which came across as rather stilted and never really came across as a natural champion of justice. Elsewhere, I couldn’t help but feel that Morgan really rather dropped the ball in weaving together effective and engaging multiple character strands across the jurors, instead pulling the focus out a little too wide. Some strands were left under-developed – the teacher left pregnant after sleeping with a child, the Eastern European wife lonely beyond belief; others were given more attention for little real benefit – the young man with suspected Asperger’s whose family kept appearing, the PA impersonating her boss on the jury having to constantly recap events. I just didn’t feel the connection with this group of people and their supposed dilemmas and wanted the show to focus more on the deliberations of the trial and their interactions with each other. The heavy handed introduction of themes like the nature of citizenship, civic duty and the tradition of trial-by-jury didn’t help matters either. I did however like the main story strand of the manipulation of Paul, a man living with his ageing mother, by the mysterious Tash. Steven Mackintosh brought the right level of engaging everyman earnestness to a man who can’t quite believe his luck when Lisa Dillon’s Tash (rocking a fabulous hair-do) starts paying him attention. All is not what it seems though and the way this all played out was the most satisfying bit for me. Good thespy spots in here were Roger Allam’s prosecuting counsel though perhaps not given quite enough to do, Paul Bhattacharjee’s curious father and Ronald Pickup’s beautiful judged performance as a pensioner whose eyes are opened, plus Jodhi May’s teacher, Will Mannering’s police officer and Thusitha Jayasundera’s doctor, interesting actors all. And so it was ultimately a fairly enjoyable watch, the 45 minute episodes pass by quickly and it’s all rather painless – it’s just the bar had been set rather high from the original McCrory-starring iteration of this idea.